We immersed ourselves in the cauldron of ICElab for Dan Dehaan’s workshop at ICEhaus Brooklyn on April 3-5, 2013, the second part of his two-stage residency. In January, Dan met with his ICE collaborators — Nathan Davis (percussion), Tony Arnold (soprano), Rebekah Heller (bassoon), Kyle Armbrust (viola), and Katinka Kleijn (cello) — to explore his compositional concepts and the timbral, dynamic, and performative possibilities of each of their instruments. Dan’s second phase objective was to begin forming these sounds and ideas into the musical substance of the project. It was exhilarating and instructive to see the art and craft of music-making up close. The first two days, we observed Dan interacting with the musicians in various groupings as they worked through a preliminary score. We were fascinated to see how ICE performances we observe as so flawless and assured are built from many agonizing moments of experimentation, uncertainty, and even frustration at limits and obstacles that make perfect expression elusive. 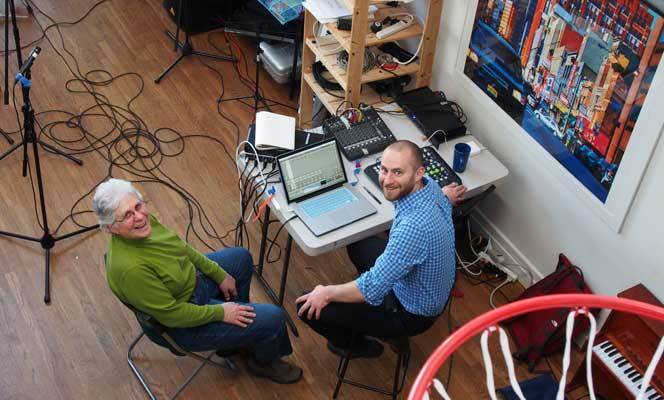 Dan worked with Nathan on various percussion instruments, testing dynamic ranges (“How loud can we make it?” Dan asked) and distortion methods to decide how to best use electronic sampling, processing, and sound distribution to an array of speakers and a newly acquired mega-subwoofer. The spatialization of the piece is highly dependent on the sound design – the number and placement of speakers and the ability for the audience to move around and experience the music from different perspectives. When Dan met with Katinka, Rebekah, and Kyle, their focus was on the pacing of an intricate melodic passage to be accompanied by Tony singing. They solved part of the dilemma by having Dan add fermatas to the score, and eventually determined that Kyle would function as conductor. When all five players gathered, the focus turned to coordinating the percussion they would play in another section sung by Tony. They decided to manage a gradual increase in volume using a series of hand signals from 1 (very soft) to 5 (loud as possible). Dan’s workshop concluded with a public performance of the work-in-process, which drew eclectic crowd of curious ICEfans. Dan described the project as both empowering and terrifying. “ICE is enabling me to make the music that I dream of,” he said, “but . . . now I have to do it!” His explained his inspiration is French philosopher Jean Baudrillard’s “The Perfect Crime,” which examines the improvability of reality. In particular, Dan is struck by the phrase “ incredible incandescence,” which Baudrillard uses in praise of the the speed of light — without it, we would be overwhelmed by the continuous bombardment of light. Then came the music, the portions of the score we had observed the group honing. Segment #1, with Nathan on percussion and Dan on processing, was the Big Bang! They achieved all the volume they could hope for. Nathan started with a burst on a huge bass drum, then subsided, then built up to a huge distorted crescendo, evoking that unbearable sensory bombardment. In Segment #2, Kyle, Katinka, and Rebekah began very quietly, straining to be heard. Then the volume grew and the texture became more complex, led by the viola. Tony came in singing “It’s always moving” and repeated that phrase as the music swirled and orbited around the room. This section was slow, serene, seductive, then just faded away. They closed with Segment #3, for all five players, plus Dan on processing. Rebekah, Katinka and Kyle moved to the upper level to play gongs and triangles. Nathan started, striking prayer bowls in a complex pattern, manipulated by Dan in repeats. Tony began to whisper as the bowls quieted, then Dan added repeats of her whispering and the bowls in an intricate swirl. The volume of the bowls and whispering increased and just as we began to understand the text, the gongs entered from the upper level, creating the feel of a larger space and being surrounded by music. Nathan moved to his large gong and Tony started her sequence of hand signals. Slowly building from 1 to 5, a final surge into the unbearable for only a moment, and then quiet triangle strikes to a peaceful conclusion.